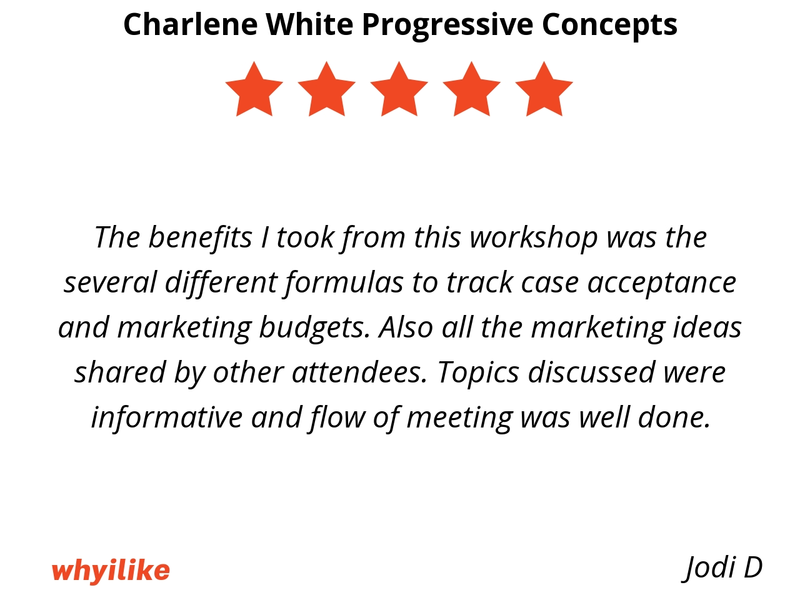 The benefits I took from this workshop was the several different formulas to track case acceptance and marketing budgets. Also all the marketing ideas shared by other attendees. Topics discussed were informative and flow of meeting was well done. 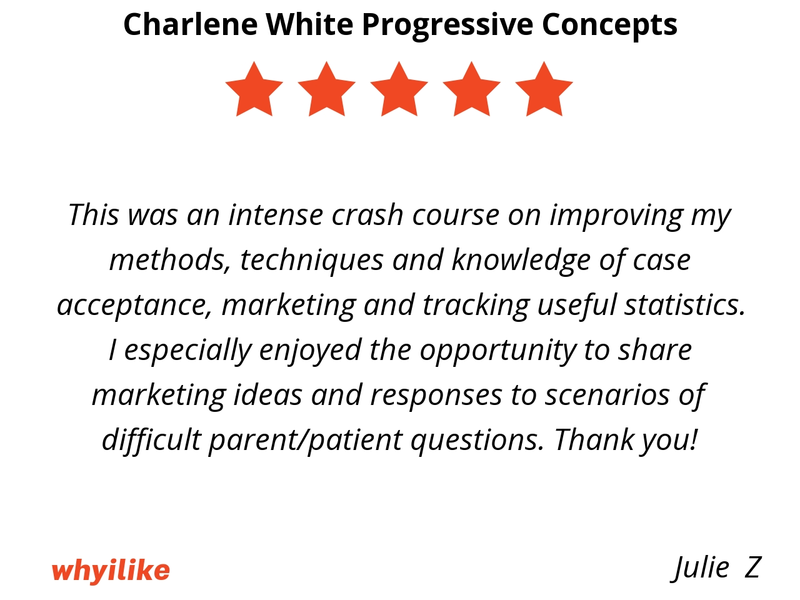 This was an intense crash course on improving my methods, techniques and knowledge of case acceptance, marketing and tracking useful statistics. I especially enjoyed the opportunity to share marketing ideas and responses to scenarios of difficult parent/patient questions. Thank you! 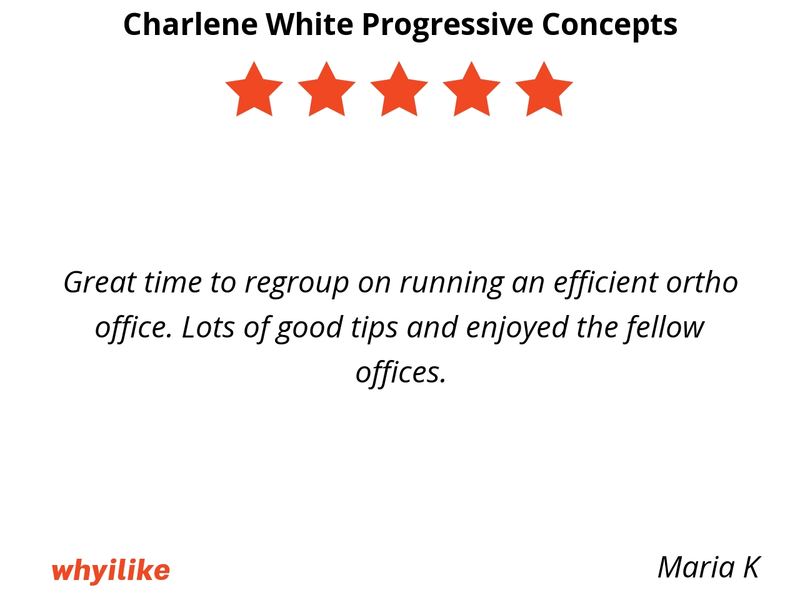 I really liked to hear from other participants and how they run there office. 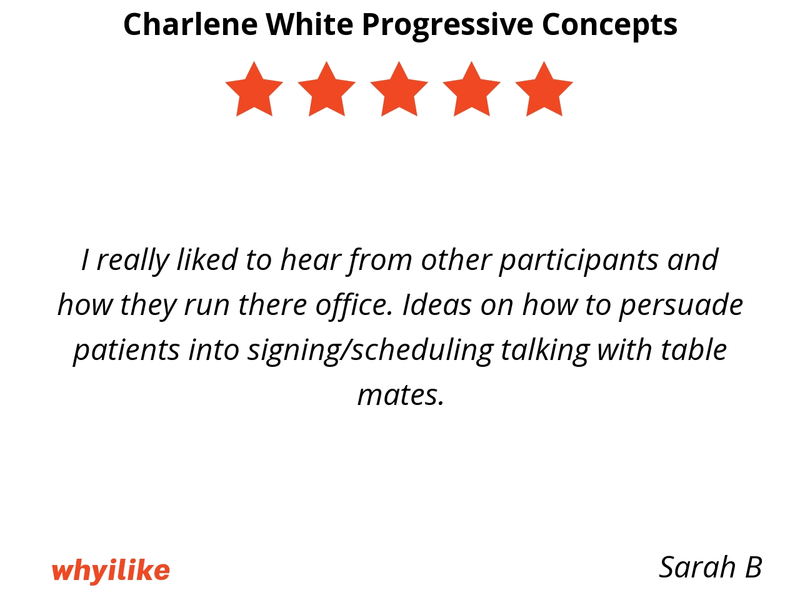 Ideas on how to persuade patients into signing/scheduling talking with table mates. The information was relative and current keeping up with the changes brought about due to technology and culture. Time was well spent and interactive. Everyone was treated respectfully and allowed ample time to ask questions. Love the materials that were provided to bring back to the office. 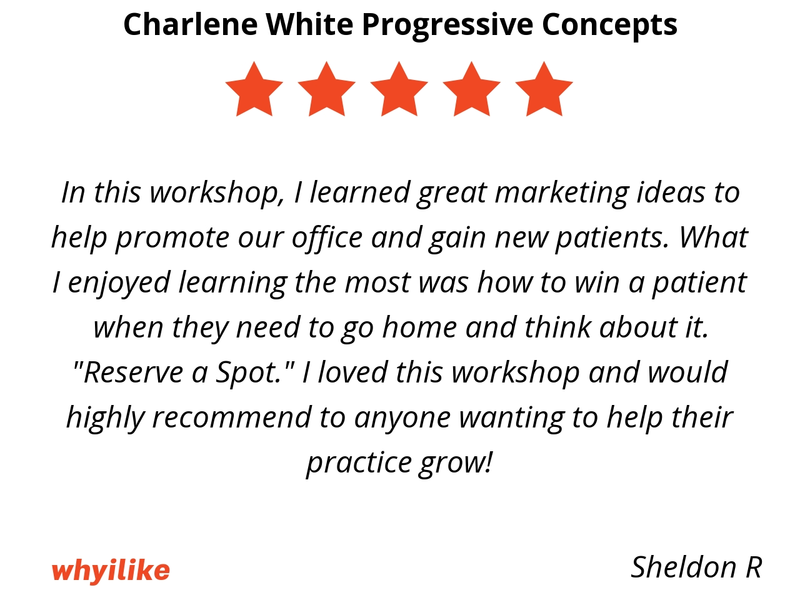 In this workshop, I learned great marketing ideas to help promote our office and gain new patients. What I enjoyed learning the most was how to win a patient when they need to go home and think about it. "Reserve a Spot." 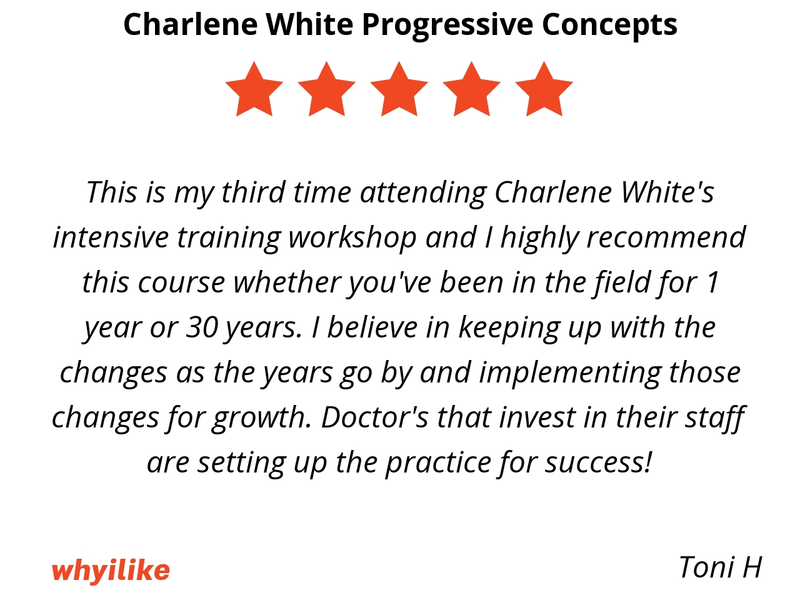 I loved this workshop and would highly recommend to anyone wanting to help their practice grow! 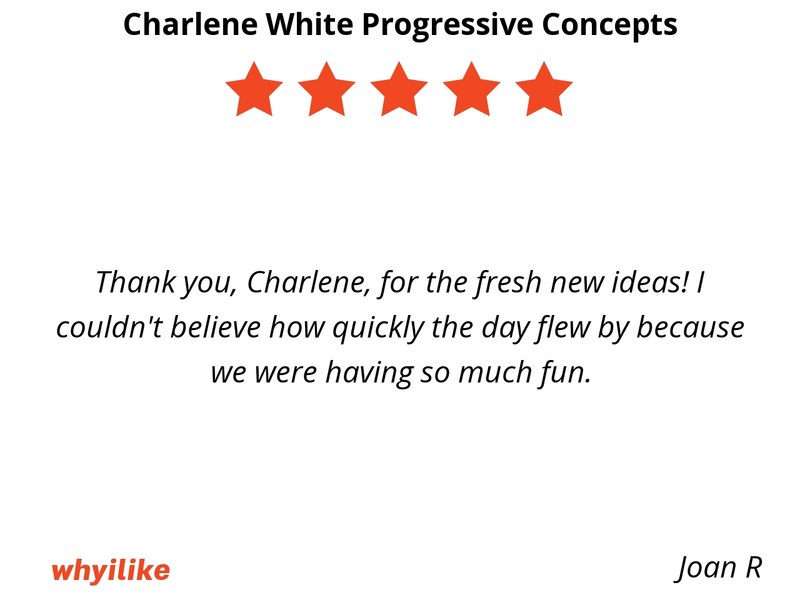 Thank you, Charlene, for the fresh new ideas! I couldn't believe how quickly the day flew by because we were having so much fun. 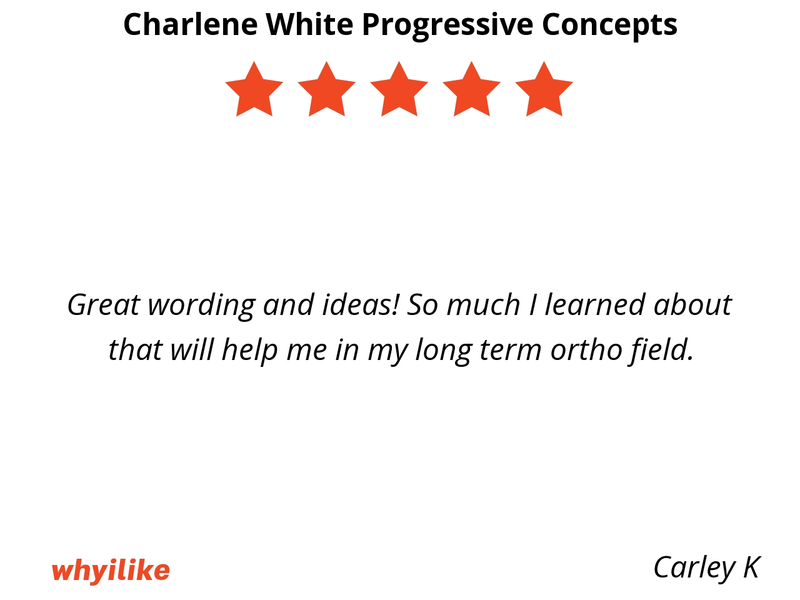 This is my third time attending Charlene White's intensive training workshop and I highly recommend this course whether you've been in the field for 1 year or 30 years. I believe in keeping up with the changes as the years go by and implementing those changes for growth. 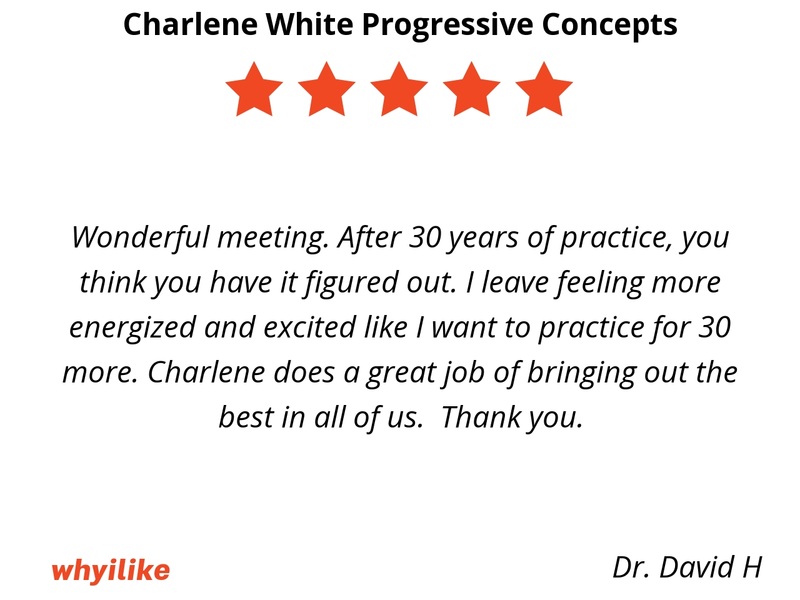 Doctor's that invest in their staff are setting up the practice for success! Very practical and informative. 3rd time I've been to her seminar and always walk away motivated with new ideas. Enjoy the interaction with the other staff members from other offices. I appreciate the concrete data presented at this conference especially after I have heard general ideas but no specific ideas/numbers to analyze from others. 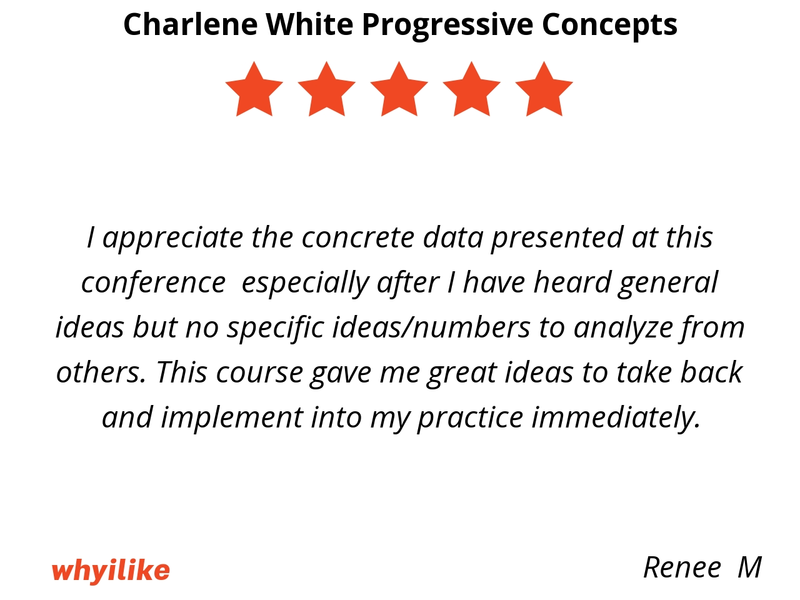 This course gave me great ideas to take back and implement into my practice immediately. Such a great meeting. Extremely informative especially coming into this new position as a TC in the office. This will greatly excel my personal/professional position in our office. 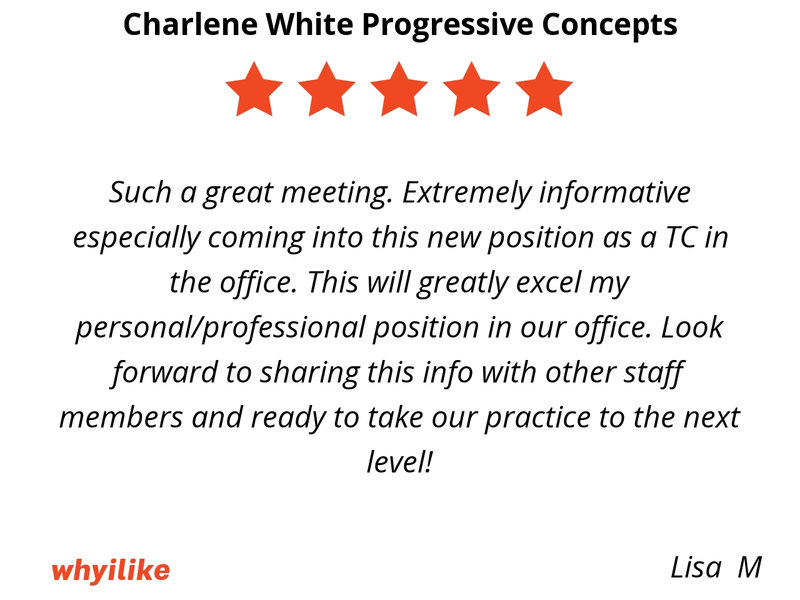 Look forward to sharing this info with other staff members and ready to take our practice to the next level! Great time to regroup on running an efficient ortho office. Lots of good tips and enjoyed the fellow offices. Great wording and ideas! So much I learned about that will help me in my long term ortho field. I learned a lot of great ideas and marketing tolls today. 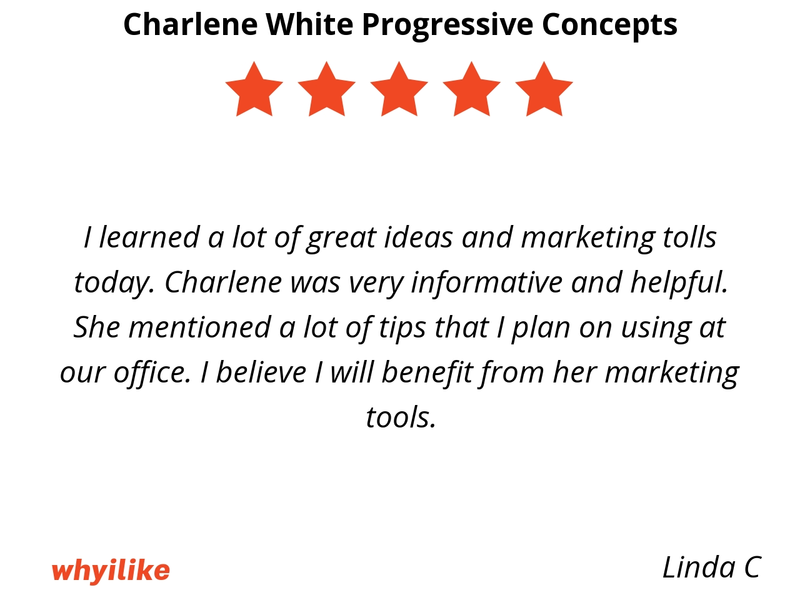 Charlene was very informative and helpful. She mentioned a lot of tips that I plan on using at our office. I believe I will benefit from her marketing tools. This seminar has been so eye-opening! So informative in such little time! I definitely enjoyed hearing everyone else's ideas and opinions. 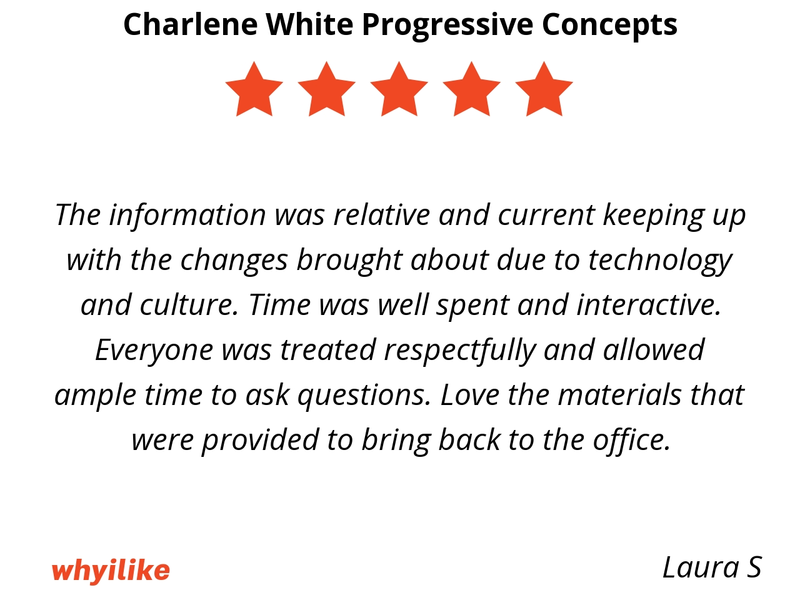 Charlene is so positive, easy to listen to, inviting - overall, I learned a lot from her and our own office. 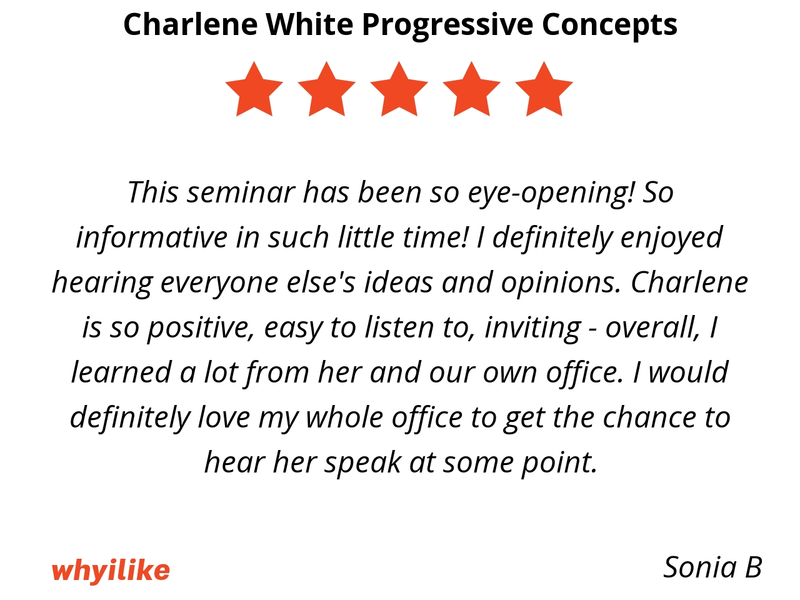 I would definitely love my whole office to get the chance to hear her speak at some point. This was such an amazing training! 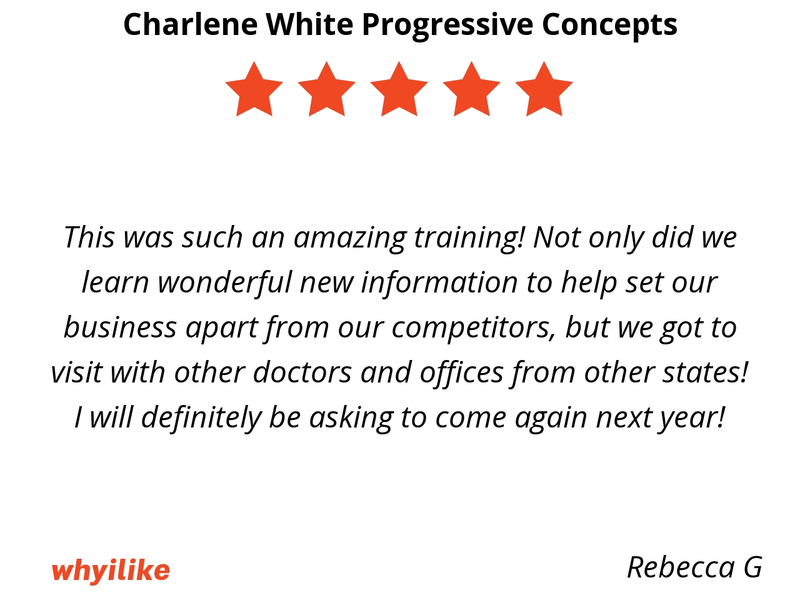 Not only did we learn wonderful new information to help set our business apart from our competitors, but we got to visit with other doctors and offices from other states! I will definitely be asking to come again next year! I loved the fresh marketing ideas. 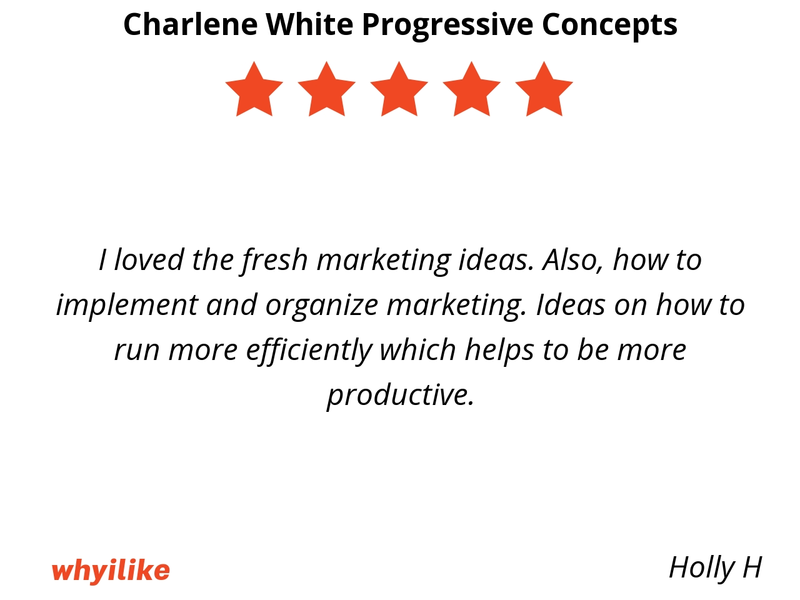 Also, how to implement and organize marketing. Ideas on how to run more efficiently which helps to be more productive. Wonderful meeting. After 30 years of practice, you think you have it figured out. I leave feeling more energized and excited like I want to practice for 30 more. 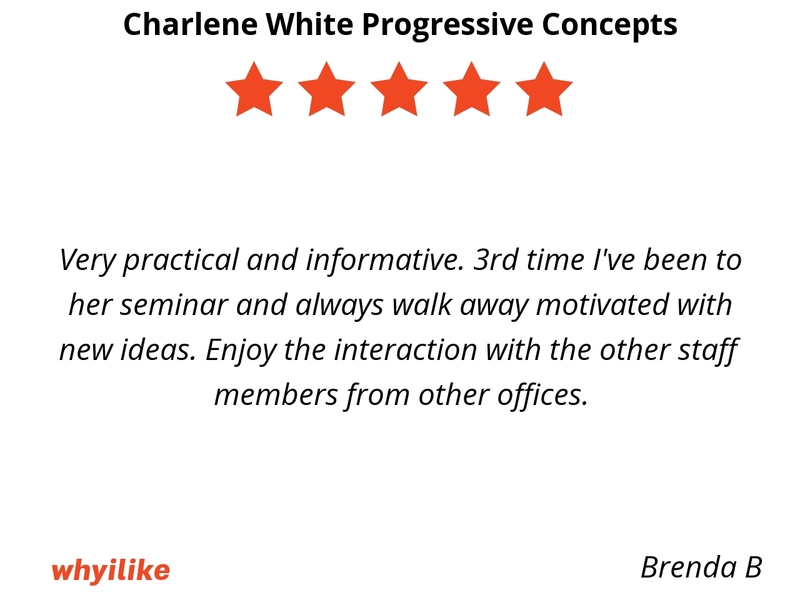 Charlene does a great job of bringing out the best in all of us. Thank you. I found that this workshop was very informative. I am happy with the information that was provided for marketing. It was great to hear the different offices' ideas. 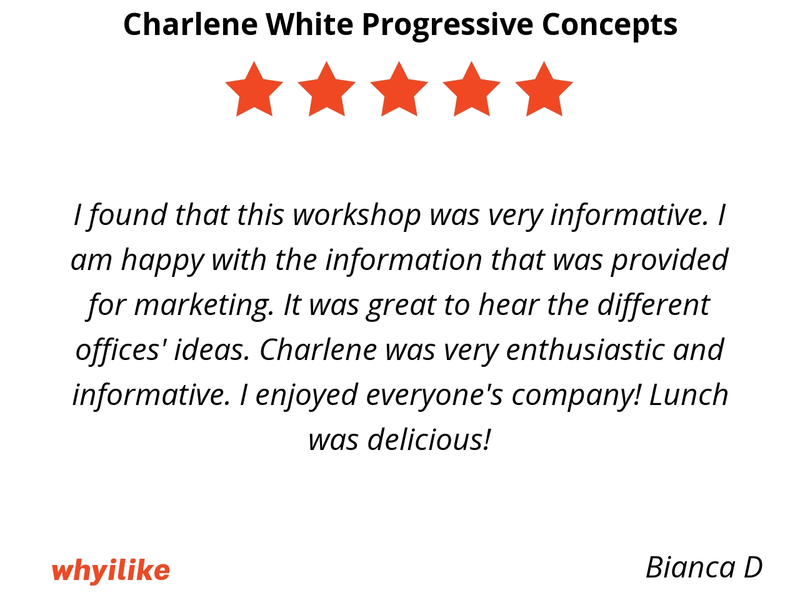 Charlene was very enthusiastic and informative. I enjoyed everyone's company! Lunch was delicious! Great and fun lecture. 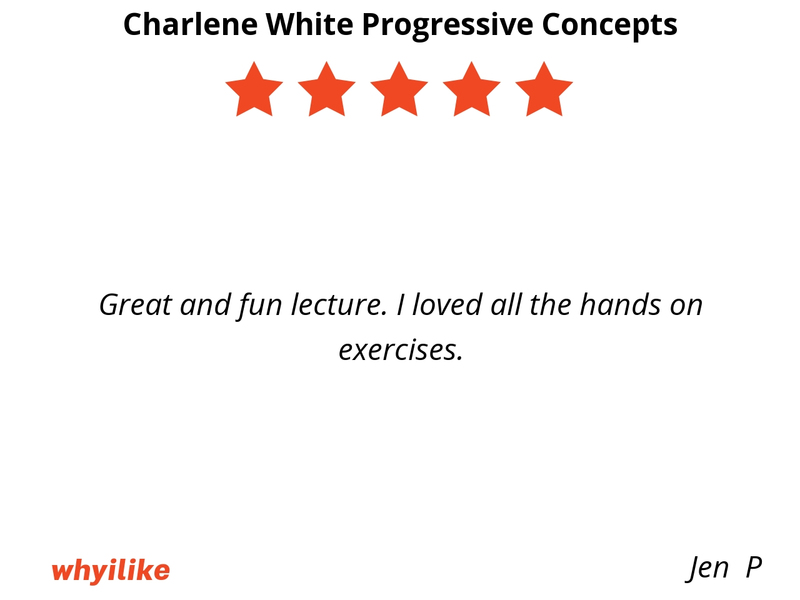 I loved all the hands on exercises. 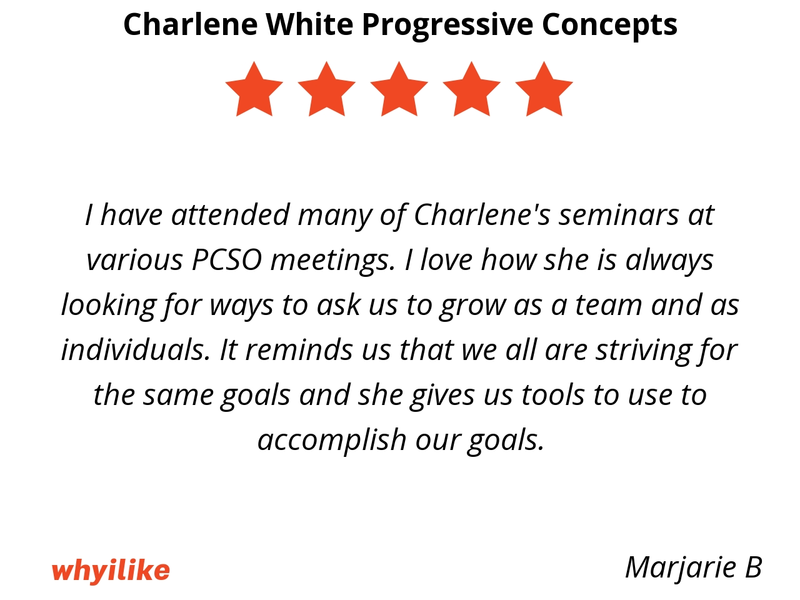 I have attended many of Charlene's seminars at various PCSO meetings. I love how she is always looking for ways to ask us to grow as a team and as individuals. It reminds us that we all are striving for the same goals and she gives us tools to use to accomplish our goals.